There’s a good chance you probably remember reading Scary Stories to Tell in the Dark as a kid. These terrifying anthologies were collected from popular folklore and paired with chilling illustrations. How could you ever forget the one with the spiders crawling out of that lady’s bloody cheek? All of those withered faces and skeletal eye sockets and surreal figures in such a nightmarish illustration style—horrifying, for its intended audience of children. If the illustrations didn’t freak you out, then the urban legends and folk tales inside surely did the job. And now, Alvin Schwartz’s bestselling children’s book series is hitting the big screen. Scary Stories to Tell in the Dark stars Zoe Colletti, Michael Garza, Gabriel Rush, Austin Abrams, Dean Norris, Gil Bellows, Lorraine Toussaint, Austin Zajur, and Natalie Ganzhorn. 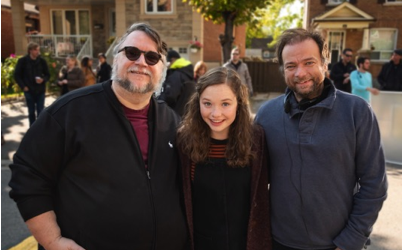 The film is directed by André Øvredal, with Daniel Hageman and Kevin Hageman writing the script alongside del Toro. Which of these frightening tales would you like to see on screen?